Miranda’s inheritance from her mother has left her in great danger, pursued by a relentless enemy. Having few choices, she disguises herself as a boy and boards a privateer’s ship to flee. Rob, a privateer better known as the Black Hawk, has been tasked by the King to find the man, Sir Ralph Evers, and do away with him. It is known that Evers is seeking to gather the pieces of a relic, and the King will have no competition. There’s a shipwreck, and Rob and Miranda are stranded on the Isle of the Dead before Rob discovers Miranda’s big secret. That’s only part of the story though, not only is she a girl, but he is attracted to her, and she’s being sought by Evers. The plot twists and winds to bring earlier holders of relic pieces to the island as the final climactic scene is to be the showdown between the holders and the one who seeks to possess. But while the story was entertaining, there was something missing. Miranda as a heroine, aside from her foretelling ability was just rather lackluster, and she felt as if she was trying to be in control more than it was a part of her personality. And Rob just didn’t come off as anything more than a man with a mission. A rather ordinary man in my opinion. He just wasn’t as engaging as I expected or wanted from my first experience with this series. Resolution could have been SO much more – but felt rather mechanical and while not forced, just without real ‘ooh’ moments. There were so many elements and questions when the relic pieces are reunited, as well as the interplay between the earlier characters that could have been expanded on, or developed to bring some surprise, passion, tension, even an aha moment….but it never came. I was disappointed in the resolution’s lack of emotional impact for me, I actually found myself trying to focus on the conclusion, a sure sign to me that integral elements are missing. I now know how the story ended, and wish this installment had lived up to the promise of the premise started two books ago. 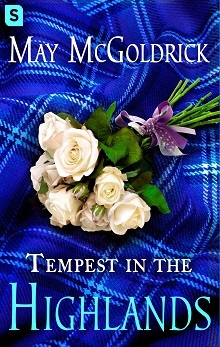 Nikoo and Jim McGoldrick wrote their first May McGoldrick historical romance using real life characters that Jim researched while earning a Ph.D. in sixteenth-century Scottish and English literature. Nikoo, a mechanical engineer, is a born storyteller. She is all about characters and feeling. Jim is about sense of place and action. Together, they have crafted over thirty fast-paced, conflict-filled historical and contemporary novels and two works of nonfiction under the pseudonyms May McGoldrick and Jan Coffey.